Scouting in North West England is about Scouting in the official region of North West England. It is largely represented by the Scout Association of the United Kingdom and some Groups of traditional Scouting including the Baden-Powell Scouts' Association. The Scout Association in North West England is administered through 8 Scout Counties. Lancaster SSAGO, covering Lancaster University and University of Cumbria (formally St Martin's College ); Students of Liverpool Association of Guides and Scouts, covering University of Liverpool, Liverpool John Moores University (JMU), Liverpool Hope University and Liverpool Institute for Performing Arts (LIPA); Manchester SSAGO, covering Manchester Metropolitan University, the University of Manchester), the University of Salford and University of Bolton; and University of Central Lancashire SSAGO, all affiliated to the Student Scout and Guide Organisation (SSAGO), are situated in North West England. Several Groups in the region were founded in 1908. These include the 1st Marple Group. Cumbria is a Scout County concurrent with the political county of Cumbria, and provides Scouting opportunities for young people and adults in the area around the English Lake District, including the town of Barrow-in-Furness, and the City of Carlisle. District badges as worn on the uniform of Scouting members. The Rawnsley Shield is an annual competition for Scouts in the Reivers District in Cumbria Scout County. Starting in the 1920s its roots go back to Canon Hardwicke Rawnsley who donated the shield to Scouting. The format of the competition changes every year and has been: a camp, where you were marked on activities; a walk to Talkin Tarn from Gelt Wood and activities at Talkin Tarn; or, recently, a pioneering contest. The current winners of the Rawnsley Shield is the 25th Carlisle. Cheshire is a Scout County concurrent with the political county of Cheshire. Alderley District Scout Band, formed in 1963 with one bugle and drum, is a traditional marching and display band in based in Wilmslow, Cheshire. It is in the Alderley Scout District of the Cheshire Scout County. The band takes part in competitions under the TYMBA Traditional Youth Marching Bands Association (TYMBA) and the British Youth Band Association (BYBA) rules, winning over 500 trophies including many Supreme Champions. In 1984 and 1994 the band was invited to play at Windsor Castle in front of respectively Her Majesty the Queen and the Duchess of Kent. They have also appeared in the Royal Tournament, on Television, in the London Parade, the Lord’s Mayor of Manchester’s Parade and toured the Netherlands in 1992 and Belgium in 1995. By 2000, the band has declined to under 10 members, only 3 of whom were under 25, and they could no longer compete. New members were recruited and from October 2003 it began competing again in competitions within TYMBA, and at local parades and fetes . In 2007, the Centenary year of Scouting, the band joined with the 1st Syston Scout and Guide Band to perform at the National Scout St George's Day Parade at Windsor Castle in front of the Queen. In November 2008 the band were crowned National Champions at the TYMBA National Finals, 10 years since they had last won the top award. Cheshire Water Activities is an independent organisation which supports Scouting in Cheshire. The Activities team provide training of leaders, and supervision of young people, in various water activities including kayaking, sailing, windsurfing, power boating, and offshore sailing. East Lancashire Scout County covers the industrial towns of East Lancashire. Greater Manchester East Scout County is one of three Scout Counties based in Greater Manchester. The area is divided into 11 districts,covering the city of Manchester itself, Stockport, Tameside, and Glossop. Glossop is situated within the county boundaries of Derbyshire, but has been included in the area due to its close geographical position near the Greater Manchester conurbation. Greater Manchester North is one of three Scout Counties which cover the metropolitan county of Greater Manchester, and provides a Scouting programme to the towns of Bolton, Bury, Farnworth, Heywood, Middleton, Prestwich and Rochdale, amongst others. The County Headquarters are in Middleton. Rochdale includes the neighbouring town of Milnrow. The District provides Scouting for about 600 members in 14 Scout Groups. Greater Manchester West is one of three Scout Counties which cover the metropolitan county of Greater Manchester, and provides a Scouting programme to the metropolitan boroughs of Leigh, Salford, Trafford and Wigan. Atherton and Tyldesley and Leigh and District were merged on 1st October 2009 to form Lilford District. Merseyside Scout County is a Scout County covering five Metropolitan Boroughs of Knowsley, St. Helens, Sefton, Wirral, and the City of Liverpool. Within Merseyside county, the Crosby district is also the home of the Crosby Scout and Guide Marina Club, who offer dinghy and kayak sailing to local youngsters, based at the newly rebuilt Crosby Lakeside Adventure Centre opened in October 2009. West Lancashire Scout County is a Scout County covering half of Lancashire, the other half being covered by East Lancashire Scout County with the two roughly separated by the M6. 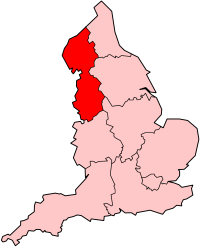 The boundaries of Lancashire were changed in 1974 as part of local government. Shortly after, the Scout Counties in Lancashire changed to reflect these border changes. West Lancashire Scout County was created from parts of the original North West and South West Lancashire Scout Counties. According to their 2006 census the Scout County had 9347 members within 154 Scout Groups. The Scout County hosts Be Prepared: The Story of Scouting, the first purpose-built Scout museum in the UK. The Scout County regularly runs a varied number of trips including training weekends in Scotland around the Cairngorms and smaller ski trips to the Alps as well as Scotland. Away from mountaineering the county also has run in the past trips to Uganda which aimed to complete a multi-purpose building to be used for health promotions, clinics for immunisation of the local population. The county has participant in International Jamboree, EuroJam and international trips to Austria, Belgium and Canada during recent years. They have also attended the Menin Gate memorials during November. Ashworth Valley, which lies between Bury and Rochdale, was purchased in 1944 by Rochdale and Heywood Scout Association Districts. It was previously part of the estate of the Earl of Egerton. The comedian/songwriter Mike Harding included a mention of "Ashy Valley" in his song about a Cub Scout going to camp. Bispham Hall is a 60-acre (240,000 m2) Activity Centre situated almost midway between Manchester and Liverpool, near to the village of Billinge. Bowley Scout Camp and Activity Centre, established in 1968, is managed by the East Lancashire Scout County of the Scout Association. The site, of 47 acres (190,000 m2) of former agricultural pasture, provides both camping sites and indoor accommodation . It has open views to Pendle Hill and the distant peaks within the Lake District National Park and North Yorkshire National Park. Activities on site include climbing walls, archery, rifle shooting, and grass sledges. A new eco-building is being constructed on site, being one of the first commercial/residential centres to be built out of straw bales. Dunham Park is a 15-acre (61,000 m2) south of the centre of Manchester. Ennerdale Scout Centre is owned and maintained by the Cumbria Scout Association County, and is located on the River Eden near to Ennerdale Water. The site only covers around 6 acres (24,000 m2), but offers a range of camping pitches, as well as some indoor accommodation for up to around 60 people. This site was previously owned by the former West Cumberland Scout County. For over 50 years, the Oxford University Scout and Guide Group has had a close association with the camp site, with students camping for a week before and after the summer camping season in the University Easter vacation and the university Summer vacation in September. Great Tower Activity Centre is located on the eastern shore of Windermere in the Lake District National Park. While it is located in the Cumbria Scout Association County, the site is maintained by West Lancashire Scout Association County. The site covers an area of 250 acres (1.0 km2). Dog Hill Scout and Community Camp Site in Shaw, Oldham and Bibby's Farm Scout Camp and Activity Centre near Chorley but administered by the Scout districts in Bolton are available to scouts, guides and other youth organisations in Greater Manchester North Scout County or elsewhere. There is also Giants Seat camp site run by Radcliffe Dsitrict. Middlewood Scout Camp is situated near the town of Worsley, near the Bridgewater Canal. Middlewood has a large number of varied size camping pitches, ranging from large sites suitable for district or group events down to small sites suited to patrol camping. The campsite features a modern toilet block with a hot water supply and showers. Two buildings, Cunliffe Lodge and the Cub Hut are also available. Cunliffe Lodge, the larger building, features a fully equipped kitchen, a main activities/dining hall, three bunkrooms (sleeping 15, 6 and 4), male and female bathrooms and central heating. The Cub Hut features a small kitchen and dining room, a lounge with tables and chairs, two bunkrooms sleeping six and four and a leaders room. One of Middlewood's main features is the large boating lake, co-leased with Broughton Angling Club. Scouts can use the lake for canoeing, kayaking, rafting and fishing. The site also has a rifle range and a large selection of pioneering poles. The Camp Team run open campfires with songs and campfire stunts on Saturday evenings during camping season..
Moor Crag Activity Centre is based on the eastern shore of Lake Windermere, near to Great Tower Activity Centre. It provides a base for a wide variety of waterborne activities. Accommodation is available in a residential block at the centre, the Waterside Wood Chalet. Alternatively camping is generally arranged at Great Tower. The activity centre has 68 m of water frontage along the shore of Lake Windermere, which includes 2 jetties and a boat house / wet dock, which is used to house the control room and safety craft. Canoes, Kayaks and Sailing boats are owned by the centre, and are available for hire. Ratlingate International Camping Centre is located 4 miles (6.4 km) south of the city of Carlisle, and is owned and maintained by Reivers Scout Association District. The site consists of 4 acres (16,000 m2) of camping field, with a further 20 acres (81,000 m2) in mixed woodland pitches. It originally had a wooden hut, which burnt down and so was replaced with a building at the top of the campsite which has kitchens, toilets and dormitorys. Nearly all Reivers camps take place at Ratlingate, including the recent Centenary Camp where over 250 people attended. Its woods can hold many activities from backwoods cooking to pioneering, and is regularly used for orienteering competitions. Tawd Vale Scout Campsite is a campsite of the Merseyside Scout County. Named after the River Tawd, which flows through the camp, it consists of 80 acres (320,000 m2) in West Lancashire. The site is currently run by the ACC Tawd Vale. Waddecar Scout Camp is located in the Forest of Bowland, in the parish of Goosnargh, north of Preston in Lancashire. The site has a large number of woodland pitches, as well as fields, allowing almost 1,000 Scouts to camp simultaneously. There are also a number of building offering indoor accommodation. Waddecar has several buildings that can be hired out by Scout Groups and other youth organisations. These include Helme Lodge and Jubilee Base. Waddecar also has several large areas for pitching tents including the Training Field and the recently acquired Bill's Meadow. The site also offers a number of activities, including Abseiling, Climbing, an Obstacle Course, Archery, Cycle Hire, and an Air Rifle Shooting Range. As well as the larger County activity centres listed above, smaller centres are owned and run by Scout Districts. Mowbreck Campsite is run by Blackpool District. Fylde District has an Activity Barn at its District HQ. Lonsdale District has two activity centres: the T.W. Helme Memorial Activity Centre at Littledale and the SilverHelme Activity Centre. The Barrow Gang Show is a relatively new Gang Show, starting in 1995. The Blackpool Gang Show was first staged in 1961. It has appeared at the Opera House, Grand Theatre & Pavilion Theatre, then from 2005, the Globe Theatre. It was visited by the Gang Show founder Ralph Reader at the Opera House. It has a cast of over 100 members from all sections of the Scout Association and Girlguiding UK along with leaders from both Associations. The Crewe Gang Show originated in 1938, although the South West Cheshire Scout District had been running an evening of entertainment for attendees of their Annual General Meeting for many years beforehand. In 1949, it was performed at the New Theatre, Crewe. This venue has continued to 2008, which will mark the 70th Anniversary. The 2006 show included 23 Cub Scouts and 62 Scouts and Leaders as the cast, and many others as production crew. 1st Marple Scout Group, with Marple Guides, are involved in the Marple Gang Show in the Carver Theatre. This show has been running continuously for over 40 years, and is nationally recognised via the Red Knecker scheme. The Warrington Gang Show started in 1951. Last year it celebrated its 50th production along with celebrating the centenary of scouting. Up until 1992 Warrington Gang Show was performed at Crosfields Centenary Theatre in Warrington, unfortunately in 1991 this theatre was closed and demolished leaving a major problem with Warrington not having any other theatre venue. Luckily Warrington's Parr Hall, originally a concert hall, was slightly modified with funding from Wizard Lottery (Warrington's old lottery scheme) to allow small theatre performances to be put on here. This venue has been Warrington Gang Show's home since. ↑ BBC - Snow bother for the Scouts! ↑ BBC: Scouts on a polar bear hunt! ↑ "Nostalgia - Happy Days". The Middleton Guardian. 2006-04-27. http://www.middletonguardian.co.uk/nostalgia/s/212/212413_happy_days.html. Retrieved 2007-03-07. ↑ "Waddecar Scout Camp - Accommodation Details". http://www.waddecar.org.uk/accommodation.htm. Retrieved 2007-09-04. This page was last edited on 6 May 2012, at 18:00.